As demand for drones grows, this defense contractor is well positioned for growth. Defense contractors are always at the mercy of their customers when it comes to driving business, and Kratos Defense & Security Solutions Inc. (NASDAQ:KTOS)is no exception. But momentum continues to move in the company's direction thanks to growing needs for drones and cybersecurity services. Heading into 2018, I think those tailwinds will not only drive operational growth, but the stock higher as well. And early 2018 signings show that Kratos should have another good year ahead. Investors can't know exactly what earnings will look like based on contract announcements, but we can get a feel for the direction things are moving. A few of the announcements so far in 2018 indicate that we're in for another good year. Kratos was one of 14 organizations that will participate in a shared-ceiling, multiple-award contract through the Test & Evaluation Technologies for Ranges, Armaments & Spectrum program worth $998 million. The Department of Defense awarded a $10.5 million task order to modernize cyberspace defense networks. An aerial drone contract was awarded for $23 million, most of which will be recognized in the next 12 months. Management also expects production to continue for multiple years after the initial contract. The Microwave Electronics Division won a $20 million contract to supply an airborne electronic warfare system for multiple military applications. Kratos won a $13.9 million contract to provide satellite command and control systems, a continuation of a previous contract. These were just some of the contracts won in January. Following the third quarter, when the book-to-bill ratio was 1.2 to 1.0 (fourth-quarter results aren't out yet), it looks like revenue momentum is continuing. There are a number of positive trends for Kratos, but we shouldn't gloss over its challenges. While revenue is growing and bookings are strong, it hasn't been able to turn a profit yet. Though management predicted the company would make the transition to profitability in the second quarter, we're still waiting. 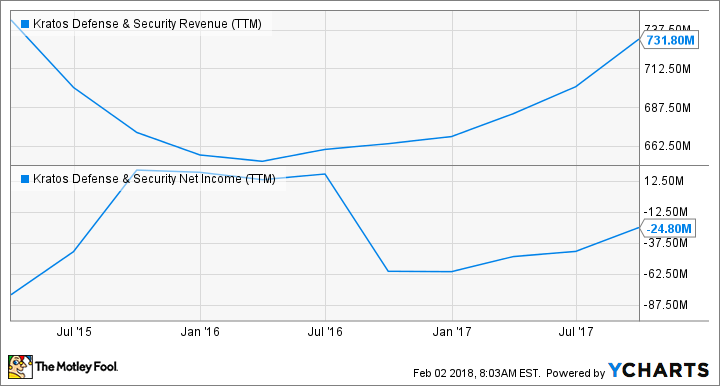 If revenue growth doesn't translate to profit growth, it'll be tough to justify further stock gains. Management has to prove in 2018 that it can generate better margins and leverage operating expenses to produces the profitability it has been promising. Despite my concerns about the lack of profits, I think industry trends are working in Kratos' favor. Drones are being used for more applications in the air and on the ground, and cybersecurity is a huge concern of governments around the world. As these sources of demand grow, so should Kratos' revenue and bottom line. That's why I think it's time to get greedy with the stock, and I'm even adding an outperform call on My CAPS page to back up that opinion.